volBrain is an online MRI brain volumetry system. It is intended to help researchers all over the world to obtain automatically volumetric brain information from their MRI data without the need for any infrastructure in their local sites. volBrain works in a fully automatic manner and is able to provide brain structure volumes without any human interaction. We encourage you to use the system hoping you find it useful. The number of cases each user can submit daily is limited to 10 cases in order to share our limited computational resources between all users. This evaluation version of volBrain is free for non-commercial and non-medical purposes. Please contact jmanjon@fis.upv.es or pierrick.coupe@labri.fr for processing large amount of data. We are looking for collaboration to evaluate and improve our platform, please contact us with any feedback. José V. Manjón and Pierrick Coupe. volBrain: an online MRI brain volumetry system. Frontiers in Neuroinformatics. 2016. A. Carass, J. L. Cuzzocreo, S. Han, C. R. Hernandez-Castillo, P. E. Rasser, M. Ganz, V. Beliveau, M. Price, V. A. Cardenas, G. Fein, J. Dolz, I. Ben Ayed, C. Desrosiers, B. Thyreau, J. E. Romero, P. Coupé, J. V. Manjón, V. S. Fonov, D. L. Collins, S. H. Ying, D. Crocetti, B. A. Landman, S. H. M. ostofsky, P. A. T. hompson and J. L. Prince. Comparing fully automated state-of-the-art cerebellum parcellation from Magnetic Resonance Imaging. Neuroimage, 2018. A new white matter lesion segmentation pipeline named lesionBrain is now available. It provides white matter lesion segmentation from T1 and FLAIR images. A paper describing lifespan normal brain volume trajectories from almost 3000 subjects using volBrain pipeline has been accepted in Human Brain Mapping journal. A paper describing volBrain pipeline has been accepted in Frontiers in Neuroinformatics journal. 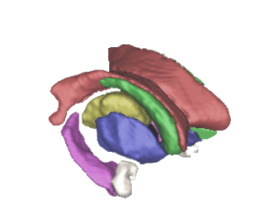 A new cerebellum segmentation pipeline named CERES is now available. It provides cerebellum lobule segmentation and cerebellum cortical thickness.